Mindwatch: Do some US Democratic Senate dance for Big Money? US bank liberalization is a contentious topic since 2008, when the government bailed-out private interests with massive public funding. 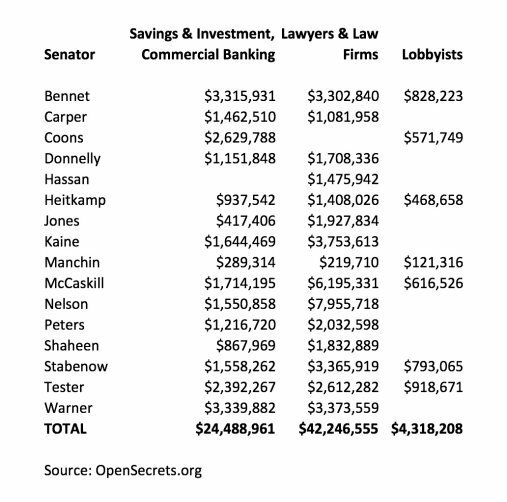 Some Democratic Senators recently joined their Republican colleagues in voting to move forward with relaxed controls over financial corporations. These 16 Senators, joined by Sen. Angus King (I-ME) and 50 Republicans are being accused of betraying their voter base (link). I believe in fact there are many more corrupt Democrat Senators allowing the rich 1% to virtually enslave the typical American. But these 16 Democrat weasels take a great deal of money from big finance and associated law firms. It is disgusting. 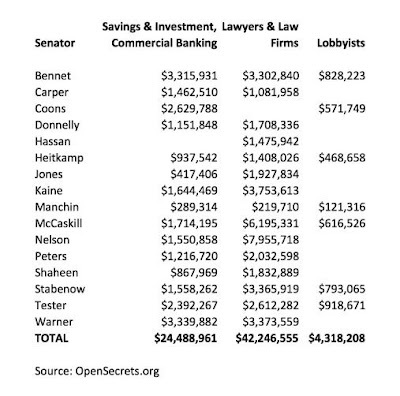 Sen. Tim Kaine, corporatist Hillary Clinton's 2016 running mate & Democratic Party VP candidate, reportedly took $1,644,469 from financial institutions and $3,753,613 from lawyers and law firms (link). Typical working people electing corporatist weasels of course are poorly served! Reported Contributions amassed by the "Sleazy Sixteen"